Speaking at the grand finale of the contest in Lagos, Mr. Fela Ibidapo, Head of Corporate Communications of Heritage Bank said the bank stands with anything that has to do with culture, adding that the bank is at the fore front of ensuring that it promotes and pushes the Nigerian heritage. Ibidapo who commended the organisers and the contestants added that the bank would continue to support the contestants and the winner in their various dreams post the event. 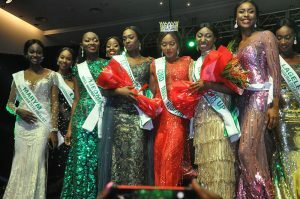 Miss Chidinma Leilani Aaron emerged as the 42nd Miss Nigeria from the South East Zone at the keenly contested beauty pageant at the high brow Eko Hotel in Lagos, beating other 17 contestants that were unveiled at the grand finale. Miss Aaron is a graduate of Business Administration from Lead City University, Ibadan, Oyo State and is the best graduating student in human resources among her set of enterprise students. She is an entrepreneur, business administrator and a chef and is currently undergoing her National Youth Service at Blencc Solutions Limited, Abuja. She is also an associate member of IPO-CRM as well as a certified COMPTIA Project Management and a Customer Relationship Management. The new Miss Nigeria has worked with top brands in television, fashion, hospitality and food industry as a presenter, model, actress and management staff. She has also served as the pioneer female president of the National Association of Business and Management Students of Lead City University chapter. 18 contestants from the six geographical zones of the country made it to the grand finale from which eliminated six to pruned down the number to 12 made up of: Ntan Nton, Egede Lagele, Thomas Mseve, Ameh Munirah, Otunba Ifunaya, and Shitta Remilekun. This was subsequently later reduced to five by the panel of judges made up of Rita Dominic, Jasmine Tukur, Fade Ogunro, Tatiana Moussalli among others, from which Miss Aaron emerged. The five finalists were Dunu Chisom, Ntan Sharon Nton, Ameh Munirah, Agida Stephanie and Aaron Chidinma Leilani. Dunu emerged the first runner-up while Ameh was named the second runner-up. 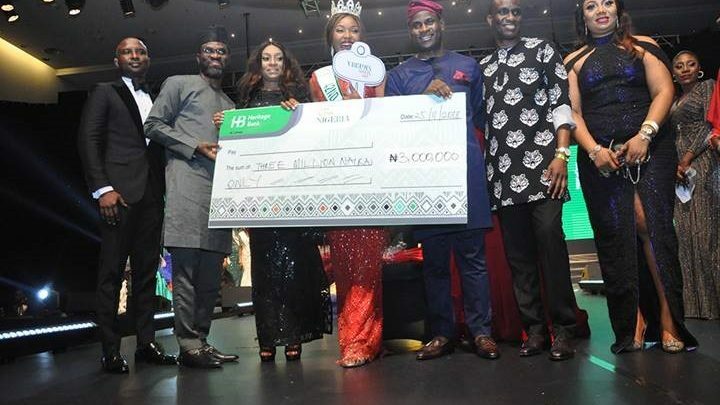 Miss Aaron, the winner of the pageant, took home N3 million from Heritage Bank. She takes over the crown from Mildred Ehiguese who won the 2017 edition. The Miss Nigeria beauty pageant started in 1957 as a photo contest. Contestants posted photographs of themselves to the Daily Times headquarters in Lagos where finalists were shortlisted and were invited to compete in the live final. A UAC employee, Grace Oyelude won the maiden edition of Miss Nigeria and used part of her £200 prize money to travel to England to study Nursing.